Now that it's summer and you're moving into a new place (or back home), you might be in for a new look for your room. You might think it's pretty difficult to keep changing up your decor since poor college students are, well, poor - but that's the beauty of it! You probably live in a small space and don't own too many permanent valuables, so all it takes are a few replacements or additions to change up your whole color scheme. 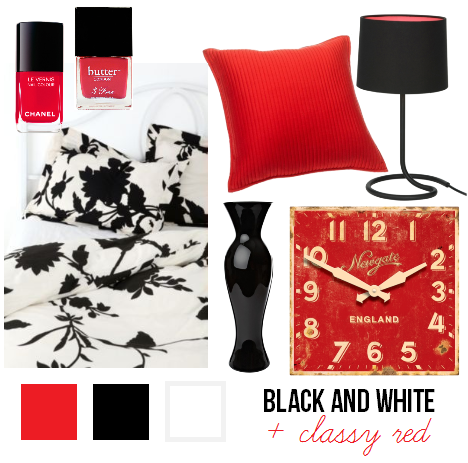 A red, black and white color scheme shows off a bold, classy room. Change your bedsheets to include a black and white design, plump down some red pillows and wall decor, and let your white walls speak for themselves; there's no need to even bring out the paint! Add a few finishing touches with a black vase and a display of your red nail polish collection. Watch for more decor inspiration coming soon to College Gloss! Will you be doing anything to freshen up your room this summer?